Sometimes we forget that these beautiful trails we take for granted (especially at National Parks) are the result of blood, sweat and tears from trail crews doing their job (and doing it well!) 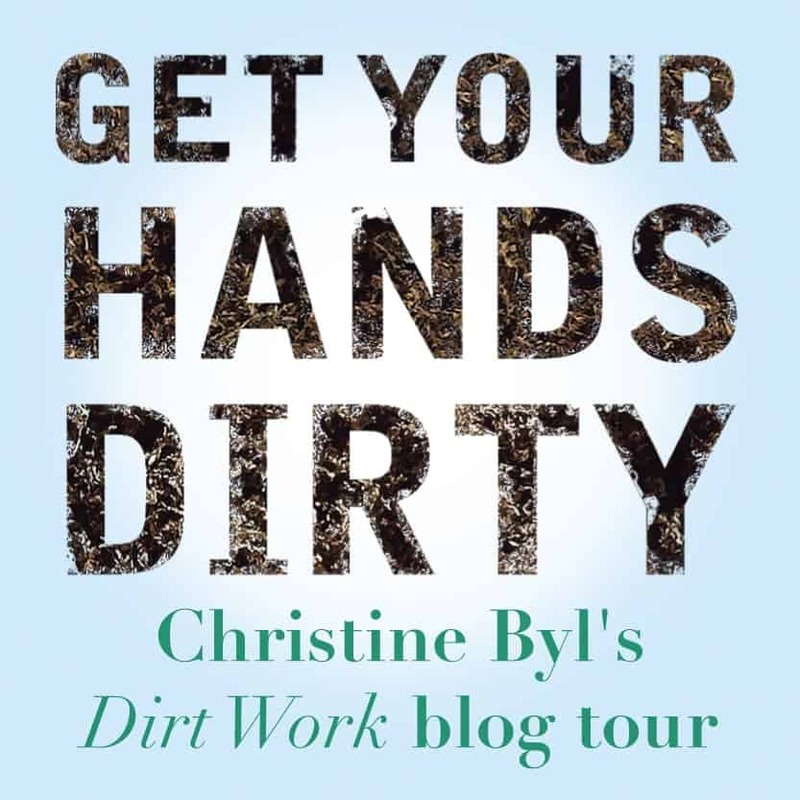 I love this new book by Christine Byl all about her experiences on the crew and literally getting her hands dirty. As we celebrate National Parks this week (which also means they are all FREE this week too!) I think it is a great opportunity to reflect on some parts of it you just don’t think about (like all the people that work hard to make it usable for us…) Note: we are giving away a copy of “Dirt Work: An Education in the Woods” so make sure to read all the way to the end! 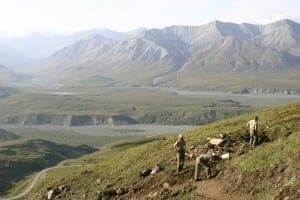 I’ve done trail work for sixteen years, mostly in National Parks. Over the years, I’ve talked to every kind of park visitor you can think of: college kids on a backpacking trip, day-hiking families, newlyweds from a big city with brand-new gear, a reunion of high school friends, endurance athletes vying for their fastest time. 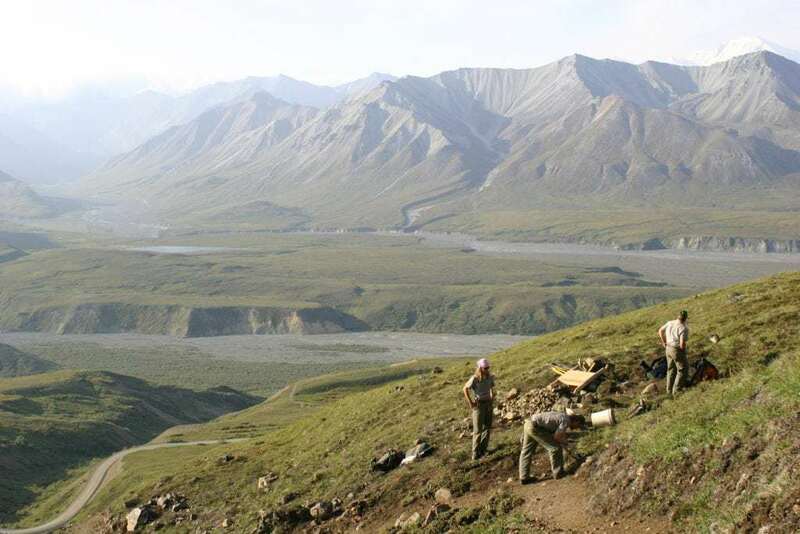 Most hikers are eager to chat with trail crews when they pass us (they need a break anyway), curious about our projects or our tools, often thankful for our work. It’s nice to be appreciated. 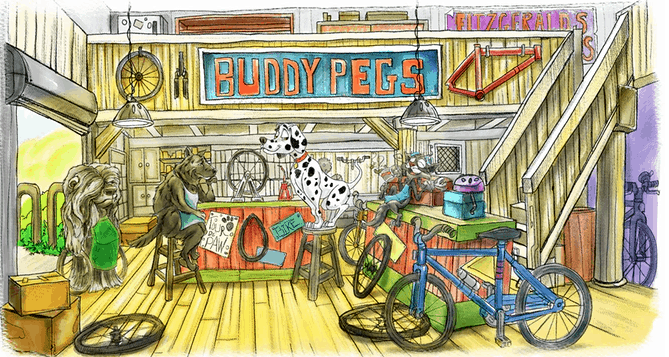 But to be honest, at times traildogs get bugged by constant questions, especially when repetitive, insulting, or unbelievable. Digging for gold? What are you, the chain gang? When do the deer turn into elk? (Yes, really.) A busy trail on a summer day can produce non-stop interactions and no time to work, so we often project stony faces behind sunglasses, give curt nods. But when a child stops at the worksite, it’s usually a highlight. They climb down into the fill pits we’ve dug, tell wild stories of the critters they’ve seen, and offer to share their sticky gummy snacks. Hikers under twelve are some of my favorite humans to encounter in the field. The kid who has stuck in my mind for years was a girl, maybe 8 or 9, out with her mother on a beautiful alpine trail in Glacier National Park. 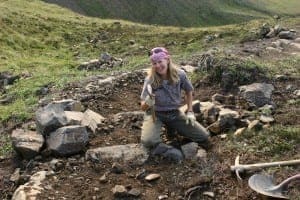 My crewmate–a fellow 20-something woman–and I were building rock steps set into a steep section of tread: tools strewn everywhere (rock bar, shaping hammer, canvas haul bags, pick mattock), massive rocks staged trailside while we leveled the dirt to lay them in place. It was a hot day and we worked in sports bras and Carhartts, our skin sweaty and dust-covered, ratty ponytails tucked up under visors. The girl and her mother hiked steadily uphill toward our shrapnel. “Hello,” said the mother, stopping for a breath. “What are you two doing?” We explained in our usual terse but friendly phrases. Rock work. Fixing a washout. Too steep. “Well thank you,” she said, taking a water bottle from her fanny pack. The girl stood quietly next to her mother, watching us while we talked. Tourists often stopped in the middle of our worksite, which could make us grumpy on a busy day, but in that heat it was nice to have the excuse to rest. I got out my own water. The girl had a drink, too. Then she looked up at her mom and spoke as if we weren’t there at all, the selective audience delivery that only kids can do. “Could I do that, Mom?” Her mother looked at us, a grimy, tired pair. “Maybe when you’re older, honey. We’ll see!” The mother was game for hiking, but did not seem to envy us our labor, or wish it on her daughter. She put the water away, straightened her shorts. “Ready?” As the girl climbed up the stairs we had finished, I caught her eye and said half under my breath, just for her, “You can totally do this someday.” She smiled and ducked her head to hide it, shy. 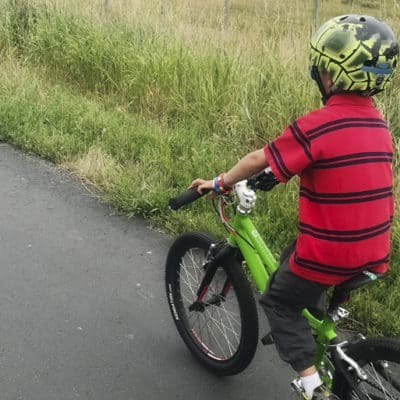 Off they went. My other favorite trail user group is intrepid elderly hikers, couples with white hair and the kind of wrinkles that come from a lifetime of sunshine, old men with rock hard calves sticking out of vintage leather boots. 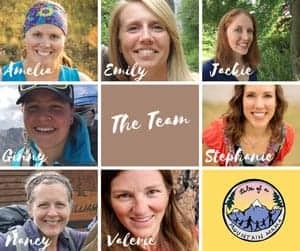 Once, I met an older woman near a trailhead as my crew headed out of an 8-day backcountry hitch. We were moving fast, chainsaw on my shoulder, intent on the trailhead, the truck, and eventually, hot showers and two milkshakes apiece. The woman was hiking up trail toward us, and coming around a curve I nearly bowled her over. I stopped to make sure she was okay and in the brief pause before we bulleted onward, she looked at our tools, our boots, and said, “Oh, I would have loved to do that when I was young.” Her voice, passionate without being wistful, conveyed a lived history of decades in which what was possible for women had changed so much, but not quite fast enough for her. “Lucky girls,” she said, smiling at us as if we were her own. I’ve never loved a stranger in pure white tennis shoes so much. I’ve thought about both of those hikers many times over the years. Is that old woman still hiking 15 years later, at 75, 80? Did that little girl grow up to be a traildog? I have no idea. But if they passed me on the trail and stopped to tell me where they’d been since I saw them last, I’d put down my tool and listen. Written much like a diary, Dirt Work is intriguing because it brings to light a life’s work that seldom people really even think about, especially from a women’s perspective. Those trails we hike on all year round have to be built and maintained by someone. Christine recounts her life, her work and the beauty she is surrounded with. The raw honesty of the book certainly ropes me in and makes me yearn for more time in the woods….and some good hard work. 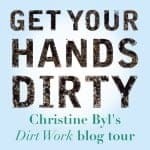 Beacon Press has very generously offered the chance for one of you to win a copy of Dirt Work for yourself. As usual, please use the Rafflecopter Widgets below to enter to win these great prizes. Winners will be emailed and announced on this post in the Rafflecopter Widget. Have questions? Please don’t hesitate to contact me at mountainmamatales(at)gmail(dot)com so I can help! This giveaway is open to the the U.S. and Canada only. 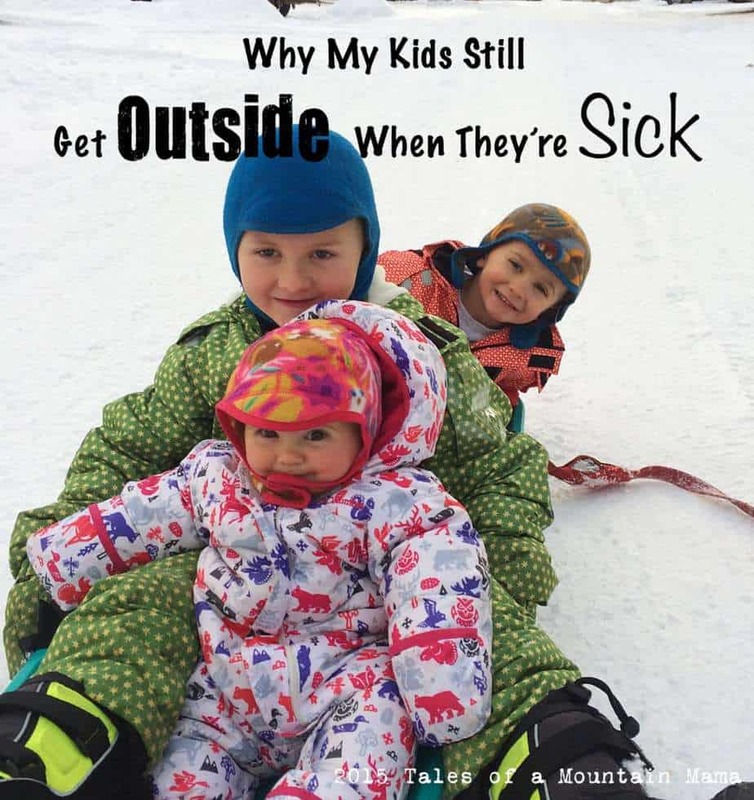 You can find this book and a bunch more of our recommended outdoor books over at our Sweet Relish list! Beacon Press very generously supplied me a copy of this book for the purposes of this review/blog tour. However, as always, the opinions expressed here are completely and honestly our own. You can find my full disclosure here. This sounds like such a cool book. 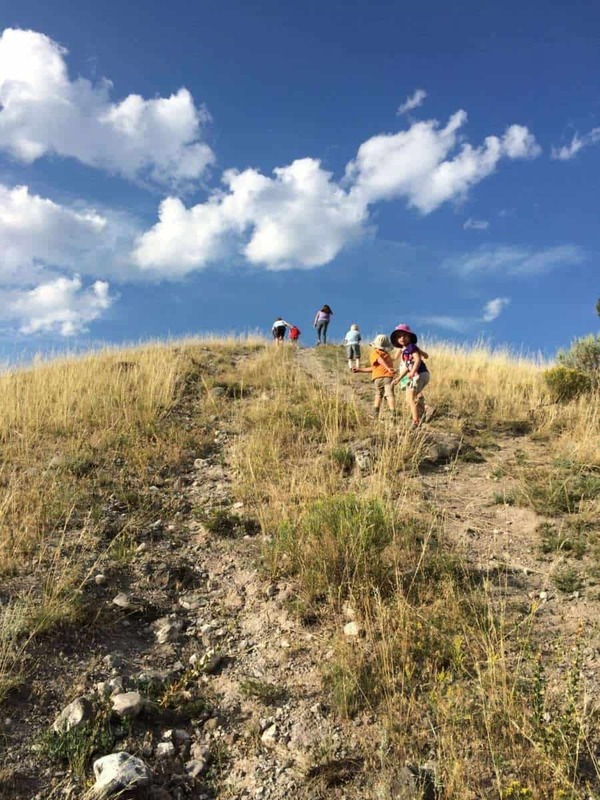 We spent most of our hike this weekend commenting on the amazing job the trail crews did making the trails we were on… Rocky, steep in places and cliff side… Lots of work!